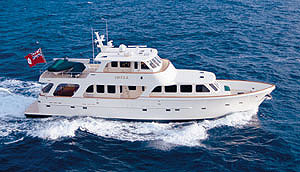 STELLA MARIS is an absolutely gorgeous 2003 McKinna 57 Pilothouse M/Y. 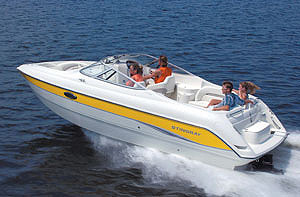 She is full of exceptional features and has been meticulously maintained. 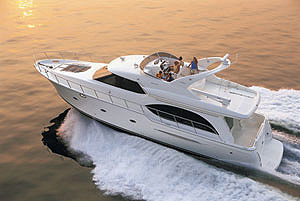 You will be overwhelmed with the attention to detail & the numerous upgrades that have been made to this vessel. With over $150K worth of upgrades, she is capable of taking her guests anywhere safely and in complete comfort. 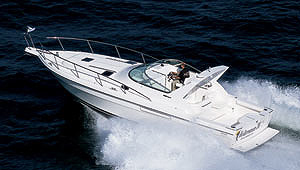 Three very spacious staterooms and two large heads. Full beam master! Her stabilized ride is smooth and quiet. The current owners have purchased their new yacht and are ready to sell this "turn-key, ready to cruise" beauty to her new owners. This is a great opportunity for someone who wants to buy a meticulously maintained & well built cruising yacht. The mid-ship Full Beam master features a walk around queen berth with lots of stowage behind the Bird's Eye Maple joinery. The master head has a Tecma electric head, sliding privacy doors and a tub/shower combo. Additional features include cedar lined hanging lockers, a vanity, an entertainment center & Shoji screens over the port lights. Carpeting though out is like new. The VIP stateroom is forward and has a Pullman Queen sized berth with lots of natural lighting, a huge opening overhead hatch, cedar lined lockers and TV. The third stateroom has very long upper and lower single berths with beautifully treated high gloss finished maple. The stacked washer and dryer are located in the companionway between the two staterooms across from the starboard side full head with walk-in shower and Tecma toilet. The spacious pilothouse offers 360 degree visibility and is very functional with dining & seating for up to six. The light and airy saloon is combined with the galley and features lots of windows and natural light. 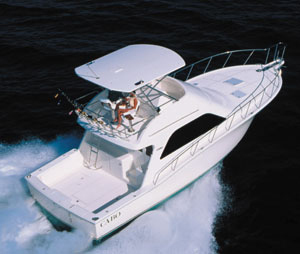 The teak soled cockpit is very large and features customized seating along with the third control docking station and built in barbecue.The bridge features a spectacular array of newer electronics, L-shaped seating, a refrigerator, side beverage dispenser a heavy duty davit & tender. Just FULLY Detailed, Ready to Cruise and Priced to Sell!